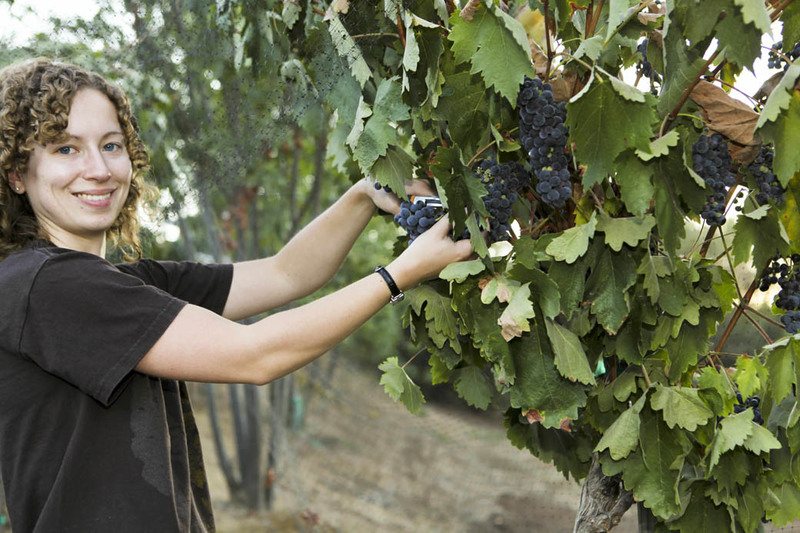 Eagles Nest Winery has been sharing the experience of wine grape farming with our friends and family since the maturing of our estate vineyards years ago. 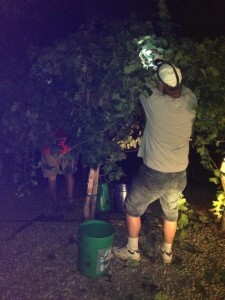 Wine grape growing and wine making is a very labor intensive process requiring many loving, helping hands. We appreciate the help especially during harvest and crush. As a reward, our friends enjoy a deluxe harvest dinner generally after a late Friday afternoon/evening harvest. During harvest Fridays, our friends and family man the vineyards, help pick the grapes, then when Harvest is finished, they enjoy wine or sangria, and enjoy a nice thank you dinner. Although the afternoon remained warm while picking. The views and ambiance of this winery are excellent and beautiful. It was an enjoyable experience. We had a most delicious and refreshing Sangria and the food was yummy. Would have liked to taste their wines. Will go again or go just to visit. Had a wonderful time. Very educational and the wine was exceptional. We learned more about the process of making wine and what all goes into it. The picking was fun and we met lots of new friends. Crush 2007 featured the processing of our Estate, Ramona Valley, and South Coast AVA and other carefully sourced vitus vinifera wine grape varietals including Cabernet Sauvignon, Zinfandel, Merlot, Syrah, and others. We also produced an outstanding ruby port that a UC Davis wine expert should sell form no less that $40 a demi bottle. The port features a USS Midway (CV-41) commemorative label. Crush 2008 featured the processing of our Estate, Ramona Valley, and South Coast, AVA and other carefully sourced vitus vinifera wine grape varietals including Cabernet Sauvignon, Zinfandel, Merlot, Syrah, Picpoul Blanc, Viognier, and others. We also produced late harvest white port and ruby port wines based upon the immense success of our 2007 port offering. Crush 2010 featured the processing of our Estate, Ramona Valley, and South Coast, AVA and other carefully sourced vitus vinifera wine grape varietals including Cabernet Sauvignon, Zinfandel, Merlot, Syrah, Picpoul Blanc, Viognier, and others. We also produced late harvest white port and ruby port wines based upon the immense success of our 2007 port offering. Crush 2011 featured the processing of our Estate, Ramona Valley, and South Coast, AVA and other carefully sourced vitus vinifera wine grape varietals including Cabernet Sauvignon, Zinfandel, Merlot, Syrah, Picpoul Blanc, Viognier, and others. We also produced late harvest white port and ruby port wines based upon the immense success of our 2007 port offering. Crush 2012 featured the processing of our Estate, Ramona Valley, and South Coast, AVA and other carefully sourced vitus vinifera wine grape varietals including Cabernet Sauvignon, Zinfandel, Merlot, Syrah, Picpoul Blanc, Viognier, and others. We also produced late harvest white port and ruby port wines based upon the immense success of our 2007 port offering. Crush 2013 featured the processing of our Estate, Ramona Valley, and South Coast, AVA and other carefully sourced vitus vinifera wine grape varietals including Cabernet Sauvignon, Zinfandel, Merlot, Syrah, Picpoul Blanc, Viognier, and others. We also produced late harvest white port and ruby port wines based upon the immense success of our 2007 port offering. Crush 2008 started on August 15, 2014 at 5:30 p.m. Harvest lasted until 8:00 p.m. This picture is of our friends and family during the night portion of the harvest. We harvested Tempranillo and Zinfandel. August 16, we harvested Cabernet Franc. 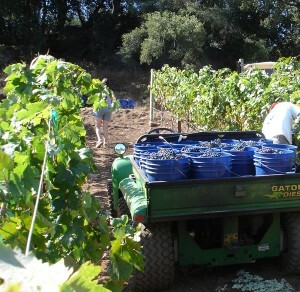 Crushing and desteaming was performed on the Tempranillo, Zinfandel and Cabernet Franc on August 16.